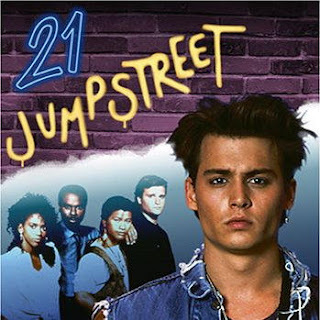 Poetry & Popular Culture takes a break from the poetry of American highways today and turns its attention, instead, to the poetry of another street—21 Jumpstreet, the late 80's FOX t.v. drama that "focused on a squad of youthful-looking undercover police officers investigating crimes in high schools and other teenage venues." It turns out the show was more than just a vehicle for Johnny Depp; it was a vehicle for poetry as well. The rest of Jump Street Chapel's walls are covered in posters of Marilyn Monroe, James Dean and Jimi Hendrix, but Parker's verse fits right in, especially as it appears to have been written by hand in all capital letters—a script that recalls the graffiti font of the show's title and that to some extent casts poetry reading as an outsider or undercover activity. "...and his imagery and rhythms are still considered today some of the most urgent in contemporary poetry. 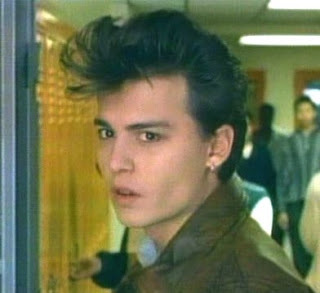 So take a few minutes now to read this short work, and read it a couple of times, paying specific attention to his layers of imagery and how those images collectively build to their own inner conclusions..."
At this point, Depp shows up at the classroom door and puts a temporary stop to Miss Chadwick's lesson. 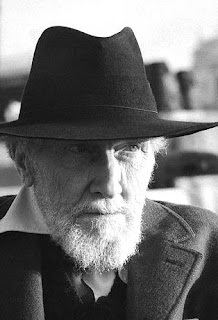 Later on, we see the names of Ezra Pound (pictured to the left) and Carl Sandburg (not pictured to the left) written on the chalkboard, and we see what appear to be poems written on, and tacked above, the chalkboards. What a classroom! In the end, as befits a crime drama, we find out who's been stalking Miss Chadwick and who's been vandalizing the school. Miss Chadwick finds out that Depp's really working undercover and is thus an eligible suitor. 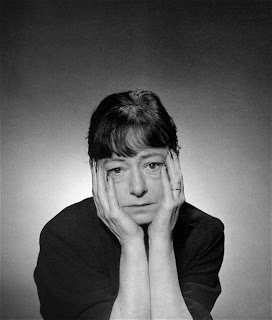 But despite the urgency of his imagery and rhythms, we never do find out the name of the poet whom Chadwick is describing in her lecture. In the end, it seems, poetry is the only place with any mystery left.